Country Canines was formed in the June 2012 by me, Clare Richardson. I was looking for a new challenge after a temporary position at a local dog grooming salon came to an end. I’m a farmer’s wife. We have two resident Country Canines’ dogs, Harvey and Bess. I’ve many years experience of owning dogs and larger livestock, in particular cattle and horses. We also keep hens and own and ride horses at our farm in Halmerend, where I live with my husband Duncan and children. My youngest child was born in 2002, so no tiny tots at home. Country Canines primarily offers dog walking services but is also fully licensed for home boarding. (Please click on the home boarding tab above for more info.) We understand that owners can’t always be at home during the day to keep their dog(s)’ company, exercise them or even just let them into the garden to go to the toilet. It can be as stressful for the owner, to worry about their dog enduring long periods of absences, as it can be for the dog to experience it. This is where we step in. We will come to your home, collect your dog, walk them and deliver them back to your home. 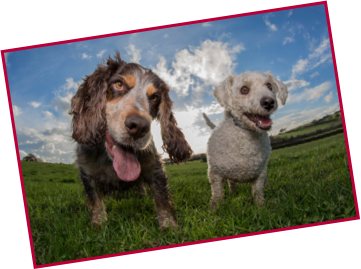 Our service is also aimed at those who cherish the companionship of a dog but are physically incapable of exercising their canine friend due to illness or old age. There’s also a temporary service for people incapacitated through injury. Let us walk your dog for you while you, quite literally, put your feet up and recuperate. Additionally we cater for your feline friends during extended periods of absence. We’ll visit your home to change litter of cats etc and we will also feed and entertain your cat(s) during our visit.